No real comments so far, other than, welcome. And good first day! Are you new to lifting? anyway i'm excited to start the program since ive heard/read only good things about it! Welcome to the wonderful world of strength training. Glad to see you're gettind indoctrined in the correct way, with this website and the experience of many posters on here. I saw your comment about cutting down the ab work. Don't cut it out, just go heavy and train like any other part of the body. Strong abs are essential for strong squats and vice versa. Instead of those twisting machine things, start doing more overhead work. That will engage your core and give a workout to your obliques and other supporting muscles. One arm overhead lifts are especially good for this. You're doing presses now which is great. Keep doing those and add some variety to your lifts with single arm varieties. Just something to think about. Stick to your current program for now while you build a foundation and gradually experiment with new exercises. stuward wrote: start doing more overhead work. That will engage your core and give a workout to your obliques and other supporting muscles. One arm overhead lifts are especially good for this. You're doing presses now which is great. Keep doing those and add some variety to your lifts with single arm varieties. Just something to think about. Stick to your current program for now while you build a foundation and gradually experiment with new exercises. I probably have a good 5-6 months before I can change the main lifts (SS and all...). would any of said overhead work be good as assistance exercises? I like the simplicity of your training and it is nice to see a newb focus on compound lifts. Guys seem to want to focus on crap when they start off. I have a question and a suggestion. I would suggest you do some rows. If you don't you can get a muscle imbalance eventually causing some shoulder problems. I'd suggest Kroc rows or dumbell rows. My question is why are you doing direct forearm work? Is it for baseball? With deads and rows, you should be able to cut it out. hoosegow wrote: I would suggest you do some rows. If you don't you can get a muscle imbalance eventually causing some shoulder problems. I'd suggest Kroc rows or dumbell rows. -Should I do these on the same day as chins? -Can/should I do them 3x5? hoosegow wrote: My question is why are you doing direct forearm work? Is it for baseball? With deads and rows, you should be able to cut it out. I'd do them the same day you bench in kind of a modified push/pull setup. I'd also do the same scheme as your bench. It is extremely hard to grow isolated muscles like the forearm. You'd get more benefits from heavy compound work that requires a strong grip - rows and deads e.g. As a warning, I'm not very knowledgeable about training for baseball. I quit playing when the pitchers started throwing curve balls. JML--Where in Washington are you? I've lived in Kalama, Quincy, Grand Coulee, Seattle and Arlington. I lived on Capital Hill and in Ravena during med school. I love Seattle and all of the PNW. pdellorto wrote: Whoa, go dad! 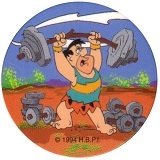 like me, this is the first time he's lifted weights, so he's doing a great job!